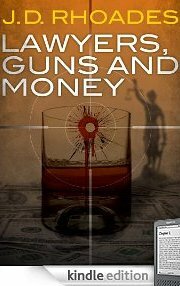 PAUL BISHOP ~ WRITER: TAKE A CHANCE E-BOOKS: LAWYERS, GUNS AND MONEY! TAKE A CHANCE E-BOOKS: LAWYERS, GUNS AND MONEY! TODAY’S FIND . . . THRILLER! Andy Cole has a pretty good life. Oh, sure, he's got two ex-wives to support and maybe he's a little too fond of good bourbon, but he's got a thriving law practice and he's one of the movers and shakers in the town of Blainesville. Then local crime boss Voit Fairgreen drops a bag full of cash on Andy's desk. Voit's brother Danny's been charged with murdering a troubled young barmaid, and Voit figures Andy's the kind of inside guy that can get Danny out of the jam. That's where things start to unravel. Will Andy Cole, the insider, a guy who's always gone along to get along, risk everything, including his own life and the life of the woman he loves, to get at the truth? Award-winning mystery writer J.D. Rhoades combines the hard-boiled tone of the classic P.I novel with the white-knuckle suspense of the legal thriller in his best book yet.